Jordan's first geocache! 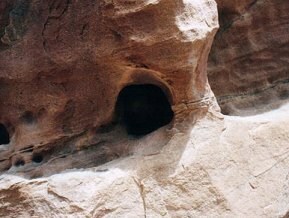 This cache is located in Petra (Jordan) on a lookout above the Habees Crusader Fort and can be found on a typical day visit to Petra. 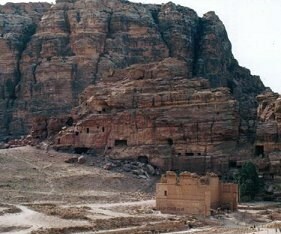 The cache is well hidden within the rock formations of Petra. To reach the cache location you will have to follow the trail through the Siq, past the Treasury and Theatre and to the City. Once in the city there are a couple of trails leading to the cache location. 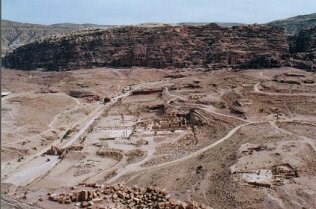 The cache is hidden in a very nice lookout location with 360 degree views of Petra. The cache is located in a 500 mL plastic bottle named 'Petra 1'. Note that the use of GPS once near the site may prove to be difficult due to the overhanging rocks blocking satellite coverage. Elevation is very important for locating this cache and the values can be found from previous finds listed below (they are encrypted). Also take a look at the photo logs to show the location of this cache from your starting point.in the encrypted spoiler below. 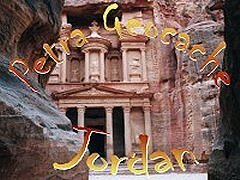 This cache can be found on a day trip to Petra as you must pass its location to visit the city or to climb to the Monastery. Pnpur vf ybpngrq ng nobhg avar uhaqerq naq avargl zrgerf nobir frn yriry (nobhg nf uvtu nf lbh pna tb ba gur uvyy va guvf nern) naq vf uvqqra va n ubyr pbirerq jvgu ebpxf. Petra 1"The Treasury" is the famous carved building at Petra. 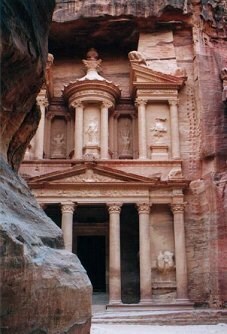 This building was featured in Indiana Jones and the Last Crusade as the entrance to the location of the Holy Grail. The cache is located about 2km from this location. Petra 3The view looking east, taken a few m away from the cache location. Petra 2You'll have to climb this hill to recover the cache. Find an unmarked trail leading up the side of this hill and climb to the lookout on the top. Petra 4The cache is hidden behind this hole in the rock.